Company Profile (excerpt from Reuters): Cerner Corporation (Cerner), incorporated on October 6, 1986, is a supplier of healthcare information technology (HCIT). The Company offers a range of intelligent solutions and services that support the clinical, financial and operational needs of organizations of all sizes. The Company’s segments include Domestic and Global. The Domestic segment includes revenue contributions and expenditures associated with business activity in the United States. The Global segment includes revenue contributions and expenditures linked to business activity in Aruba, Australia, Austria, the Bahamas, Belgium, Bermuda, Brazil, Canada, Cayman Islands, Chile, Denmark, Egypt, England, Finland, France, Germany, Guam, India, Ireland, Kuwait, Luxembourg, Malaysia, Mexico, the Netherlands, Norway, Portugal, Qatar, Romania, Saudi Arabia, Singapore, Slovakia, Spain, Sweden, Switzerland and the United Arab Emirates. As of December 31, 2016, the Company had systems in over 25,000 facilities across the world, including hospitals, physician practices, laboratories, ambulatory centers, behavioral health centers, cardiac facilities, radiology clinics, surgery centers, extended care facilities, retail pharmacies, and employer sites. Cerner Corporation is suitable for the Enterprising Investor but not the more conservative Defensive Investor. The Defensive Investor is concerned with the poor dividend history, and the high PEmg and PB ratios. The Enterprising Investor is only concerned with the lack of dividends. As a result, all Enterprising Investors following the ModernGraham approach should feel comfortable proceeding with the analysis. 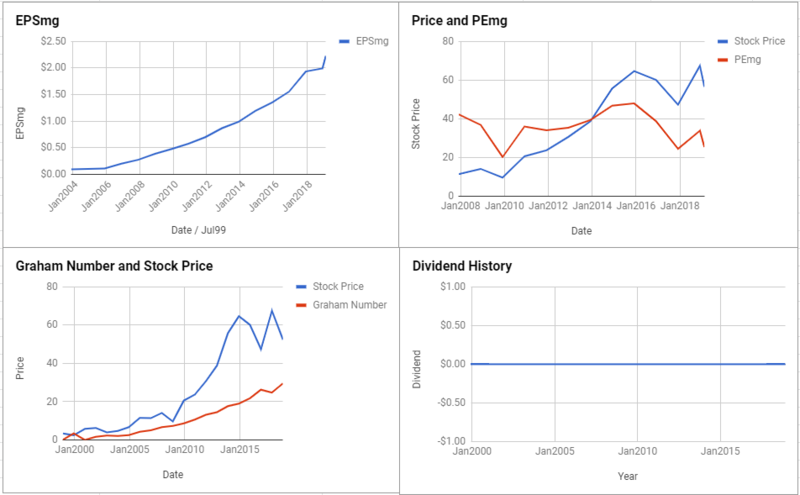 As for a valuation, the company appears to be Fairly Valued after growing its EPSmg (normalized earnings) from $1.35 in 2015 to an estimated $2.23 for 2019. This level of demonstrated earnings growth supports the market’s implied estimate of 8.44% annual earnings growth over the next 7-10 years. 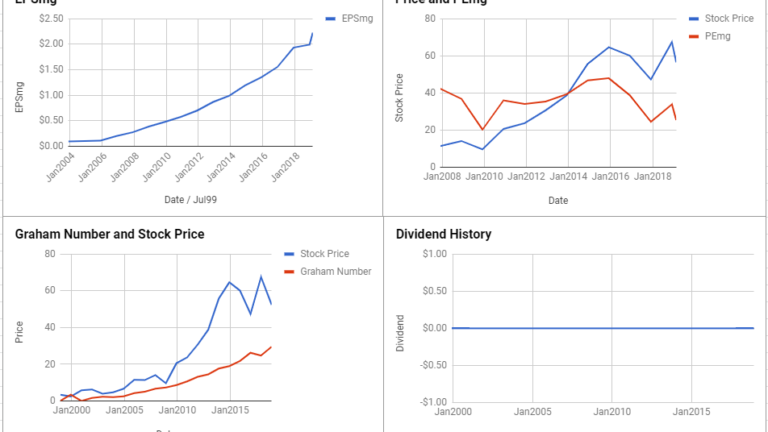 As a result, the ModernGraham valuation model, based on the Benjamin Graham value investing formula, returns an estimate of intrinsic value within a margin of safety relative to the price. At the time of valuation, further research into Cerner Corporation revealed the company was trading above its Graham Number of $29.47. The company does not pay a dividend. 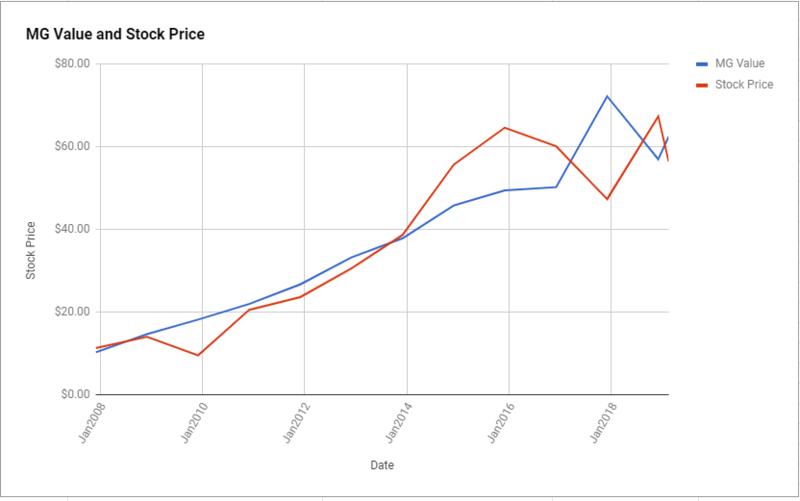 Its PEmg (price over earnings per share – ModernGraham) was 25.38, which was below the industry average of 51.18, which by some methods of valuation makes it one of the most undervalued stocks in its industry. Finally, the company was trading above its Net Current Asset Value (NCAV) of $1.63. Cerner Corporation receives an average overall rating in the ModernGraham grading system, scoring a C+.